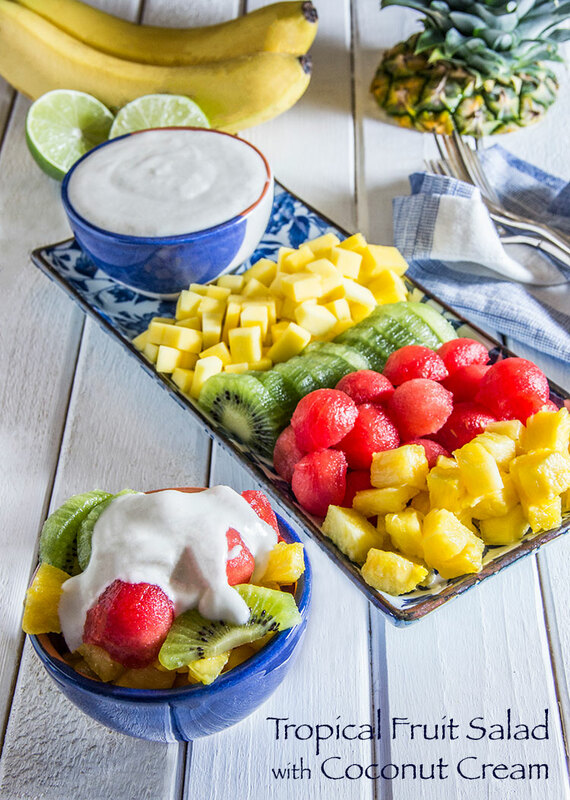 Light, juicy, fresh fruit salad. And this is the one I’ve been loving the most lately: it’s filled with tropical flavors like pineapple and kiwi and topped off with a dollop of sweet coconut cream. 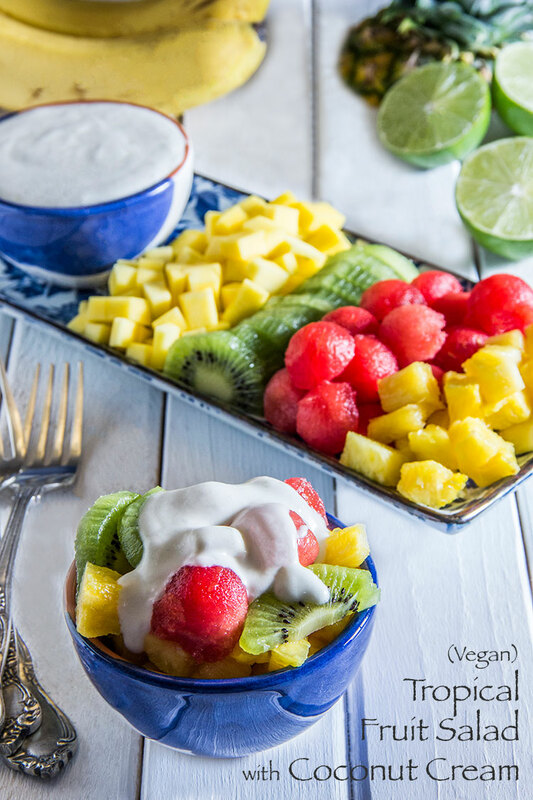 The fruit is so naturally sweet and the coconut cream is so rich and full of flavor, this treat works as a dessert. The coconut cream is easy to whip together. It’s made from coconut milk and, blended with a bit of cornstarch, develops a thick, Greek yogurt-like consistency. It has a really scrumptious hint of sweetness (from some confectioners sugar and vanilla extract) and a tangy hint of lime (from fresh lime zest). Bonus: since this treat is made with coconut milk, it’s vegan and cholesterol-free. It’s bright, healthy, fresh and delicious! To a mixing bowl, add the coconut milk, confectioners sugar, lime zest, cornstarch, and vanilla extract. Stir until well combined, cover, and refrigerate for at least 6 hours and up to 24 hours. In a mixing bowl or large food storage container, stir and combine watermelon, pineapple, kiwi, and mango. Remove coconut mixture from fridge and, using an electric hand mixer set on low speed, whip until mixture reaches a smooth, creamy, Greek yogurt-like consistency, about 2-4 minutes. 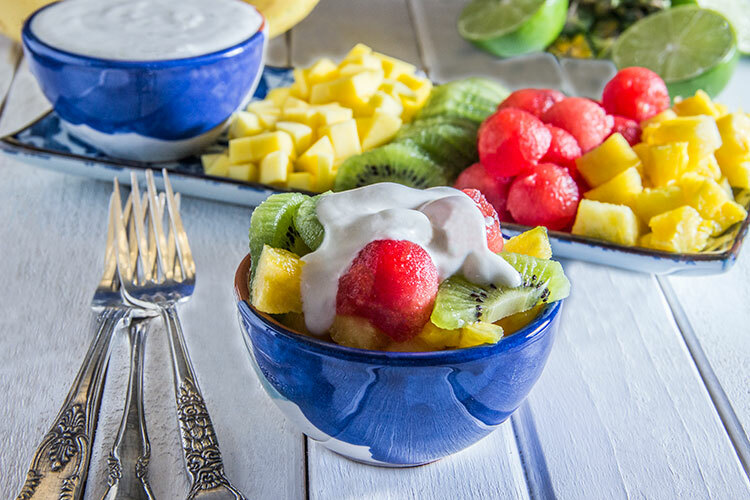 Spoon fruit into serving bowl and top with a dollop of coconut cream. Serve chilled. Storage: fruit salad should be refrigerated in a covered airtight container. Coconut cream should be refrigerated in a separate covered airtight container. That coconut cream sounds delicious! I just want to dip all the fruit in it! I never had coconut cream before. This looks refreshing and delicious. Thanks for sharing the recipe. This recipe (minus the confectioner’s sugar / or any artificial sugar) looks amazing. I will make mine without sugar and use coconut cream and a little honey instead. Although I am not a vegan, I love coconut milk/cream. Thanks for sharing. This is absolutely delicious. Going to be amazing on sticky rice with mango. Definitely worth a try, if your hesitating. I might just eat this for a couple days.